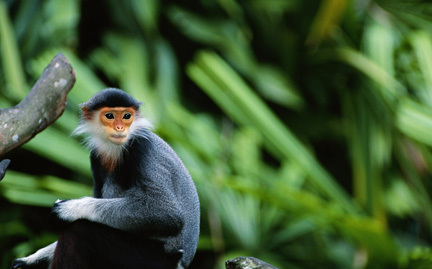 Douc monkeys are found throughout the tropical forests in China and Southeast Asia. Three species of douc live in the Greater Mekong: red-shanked, black-shanked and grey-shanked. Because of habitat loss and capture for illegal pet trade, the grey-shanked douc is one of the world’s 25 most endangered primates.